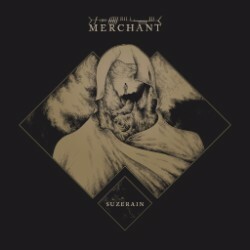 “Suzerain” sees Merchant emerge into the world as a fully-formed psychedelic doom powerhouse. The Melbourne quartet may be a new name to most but this monumental debut album will soon put paid to that. Over the course of “Seed & Soil” and “Mourning Light” the band perfect their heady blend of filth-encrusted riffs and spacey bursts. A potent mix of the epic vision of Yob and the no-nonsense sludge aggression of Weedeater, these tracks are more than capable of holding their own against the heavyweights of modern doom. These two slabs of destruction are merely an appetiser ahead of the earth-shattering title track. Over the course of 20 mind-expanding minutes, Merchant take everything that has gone before and crank the dial all the way into the red. Pulverising riffs worthy of Bongripper beat the listener into submission, repeated until breaking point, before moving onto a higher plateau of heaviness. The tension and intensity continuously ramps up over the song’s mammoth duration, building to a pummelling finale reminiscent of Mastodon’s seminal “March of the Fire Ants”. Following the title tracks’ epic assault on the senses, “Black Vein” brings the album to a close in hard rocking fashion. Merchant raise the tempo and bring some dirty stoner grooves to the table, demonstrating another side of their sound, while still retaining gut-churning heaviosity. “Suzerain” is an awe-inspiring release from Merchant and all the more impressive for being a debut. The massive potential documented here will have Merchant’s peers looking over their shoulders in fear for what this band will unleash next.